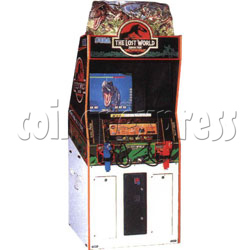 A shooting gun game based on the movie Jurassic Park: The Lost World, it's the player job to stop the rampaging dinosaur by any means possible. The player must also try to save endangered humans from dangerous situations, saving humans can reward the player with weapons or life bonuses. When the player meets a boss, he/she must pay close attention to the circle shaped target, that appear on the bosses body. These targets change color from white to flashing red, if any circle reaches flashing red, the boss will attack and the player takes damage, shooting all the targets, causes the boss damage and makes it back off for a while.